My kitties came back from the vet slightly lighter on Tuesday. Were they human, they’d be candidates for the original Sistine Chapel choir, should schoolboy myths be true. After the first evening, when I sat on the settee and let the post-anaesthetic them doze on my lap because it was the only way I could stop them trying to jump on things and miss (or worse, get there, jump off, and miss), they rapidly recovered and proved it by confiscating my wealth of kitchen paper, taking it from one élitist roll to the more egalitarian thousands of very small sheets, redistributed to all corners of the kitchen. They’re back to normal now, being six month old nuisances, as they should be. 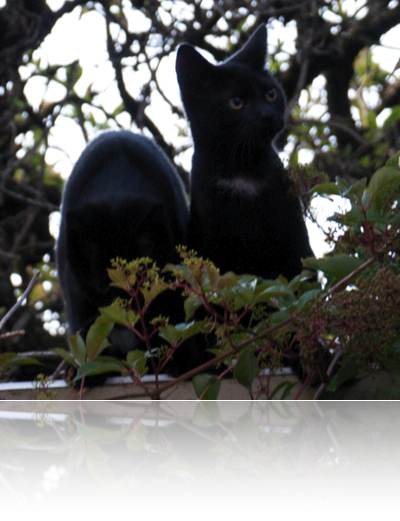 They’re back exploring the outside world, but they’ve not been back up the tree in the back neighbour’s garden yet. Or I haven’t seen them. We’ll see; today is the first day when they’re going to be shut out again, while I work. If they’re going to regain their adventurous spirit, which they may not, over the next few days the kitchen will slowly accumulate twigs.